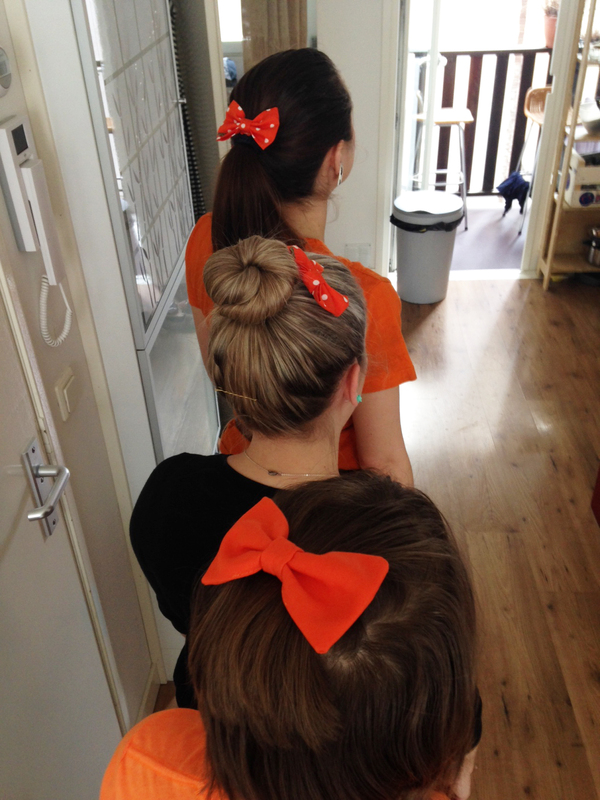 On Saturday, along with the rest of Holland, we celebrated our first ever King’s Day. Up until last year the very orange, open air city festival was known as Queen’s Day, in celebration of the lovely Queen Beatrix. 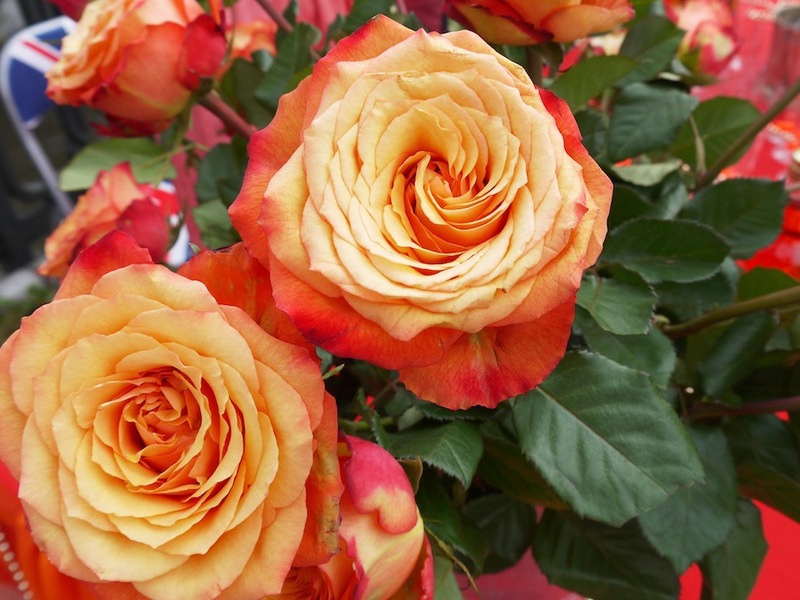 However, last year she passed along the title to her eldest son Willem-Alexander, and the holiday underwent a slight name change to represent our new monarch. Despite the holiday’s new naming convention, the crazy antics have remained the same, with endless street food and thrifting options, outdoor stages and bands, drunks, raves, party boats, and more orange than a citrus farm in Florida. The night before King’s Day is referred to as (can you guess?) King’s Night, and on this evening the city-wide party kicks off. Stages are erected, bars are set up along the canals, and everyone in this tiny country flocks to Amsterdam, in hopes of celebrating in the cool evening air with the masses. As our flat is very centrally located, year after year we have a front row view of the insanity below. 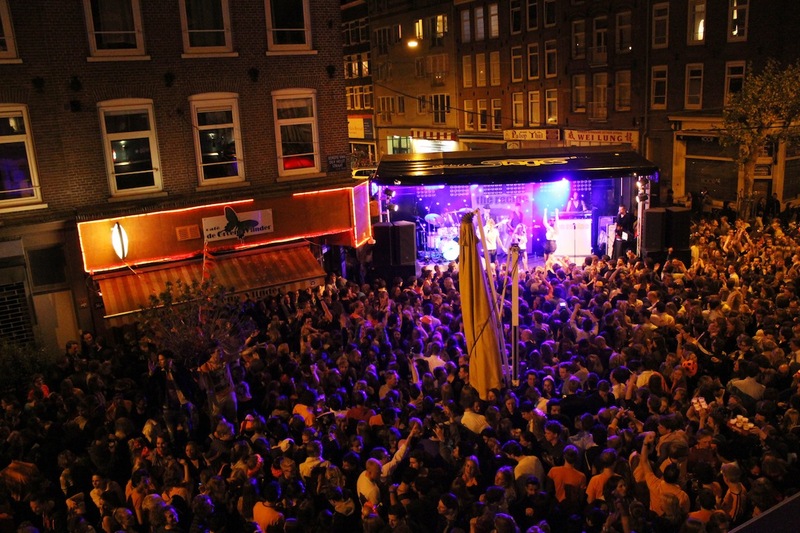 Of all places, a stage is set up across the street directly facing our windows, and the pedestrian walkways below become flooded with people, kicking off an insane evening of Dutch rock, hip-hop, and crazy euro beats. 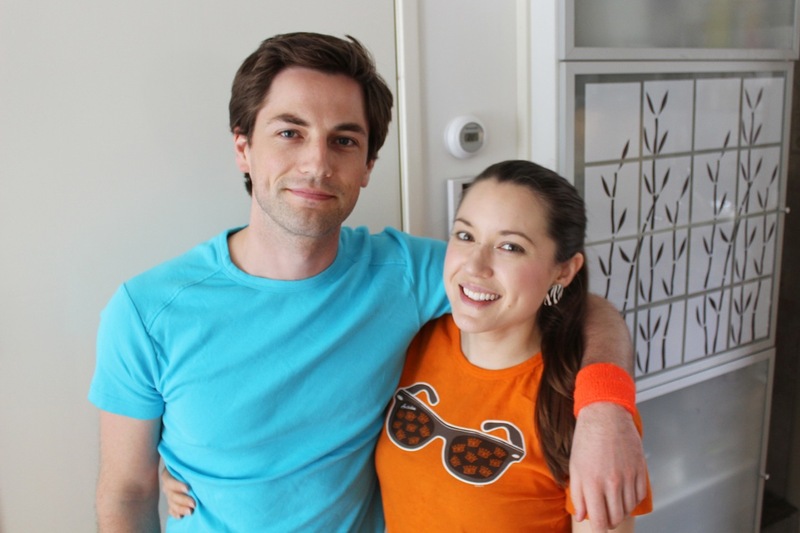 To make matters even more exciting, this year, I had two friends in town visiting for the festivities. 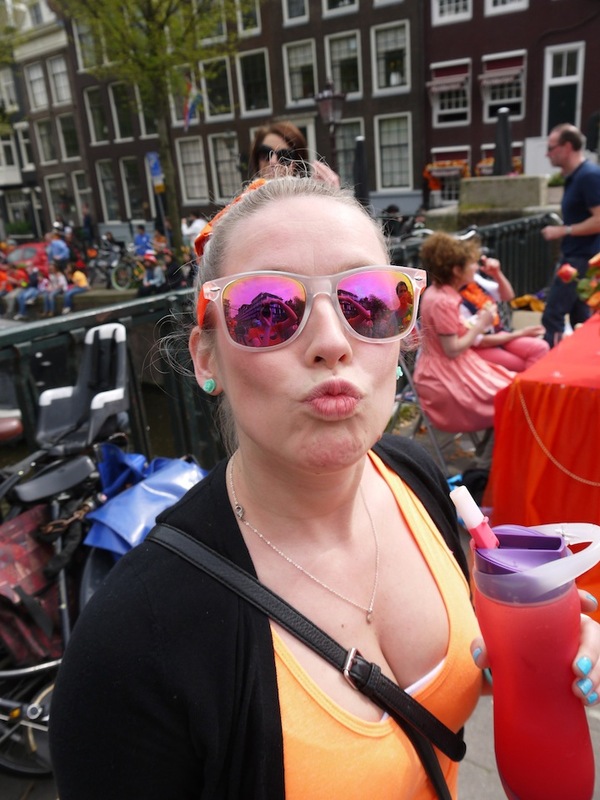 In the past three years, Amie has come to Amsterdam four times, and finally, FINALLY, this time around she came over King’s Day!! On King’s Night we made a healthy salad for dinner at the house, drank mojitos, and then hit the town. We hiked up to Tabac in the Jordaan to meet some friends, and after a good dance party in the street, we slowly walked our way back towards de Pijp, weaving in and out of the crowed, popping into a bar every now and again to pick up another drink. When we got back to the house it was almost 1am, and the rockin’ band outside was just wrapping up. We opened the windows, drunkenly locked arms and swayed to the music, while random drunks hollered at us from below to flash our boobies. Um, what? This is not Mardi Gras!! On Saturday, Kings Day, we woke up just a tinsy-tiny bit hung over – nothing a big breakfast and lots of bacon couldn’t cure. We jump started the festivities at home with coffee and amaretto (as you know I’m a big fan of the Disaronno) and then got all dolled up in our orange! We then made the most amazing cocktails – we pureed a watermelon into a cool, sweet juice, strained out the seeds, and dumped in a bottle of lemon Absolut vodka. We poured our concoction over ice, added a dash of Sprite Zero, and voilà!! Best mixed drink I’ve had in a LONG time. But before we hit the streets to party, we did a bit of thrifting. In the US, yard sales are a typical weekend attraction. 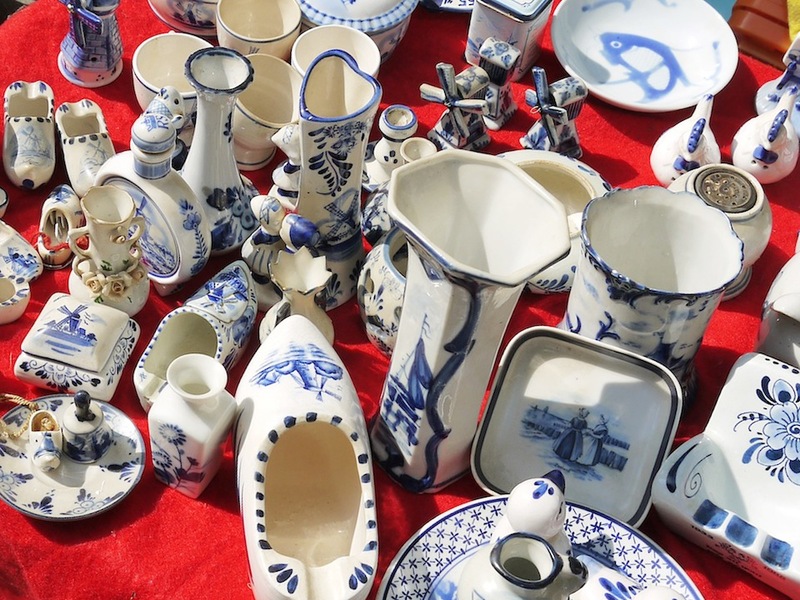 However, in Holland, King’s Day is THE day for selling your second hand junk. The streets are lined with big bins of old clothes, tarps hosting a sea of busted electronics, and tables with china and other knick-knacks. Every year I have to make a conscious effort not to spend too much money – or too much time – buying second hand junk. I would take a yard sale over a high street shop any day! I love old treasures, and B often jokes that I dress like an old lady 85% of the time. And it’s true. If I could live in my late great-great-aunt’s house, with her eclectic paisley green china, felt yellow couch, and sequined shirts, I would be in heaven. 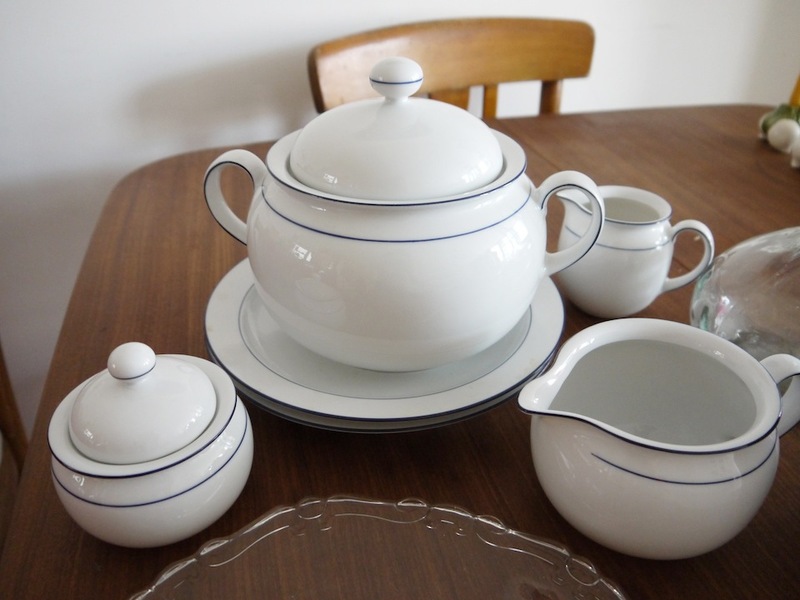 I made it home after only spending €15 – I bough a lovely soup tureen with matching plates, a gravy boat, sugar dish, and small milk jug, a decorative cheese platter, a decanter, a light blue paisley bowl and a vintage navy blue speckled juice jug. 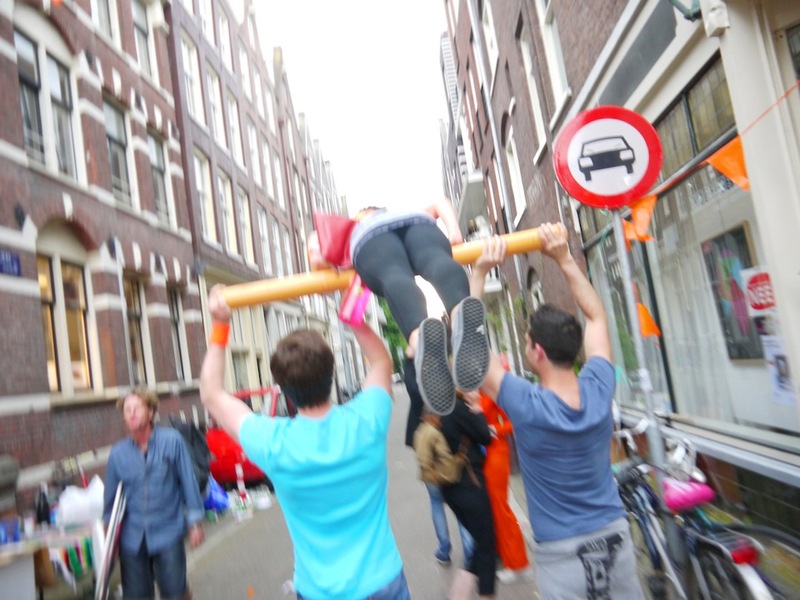 I wish King’s Day was every weekend! After a bout of shopping, we filled our water bottles with watermelon goodness, and hit the streets to party. We roamed for a few hours, bouncing from one neighborhood to the next, finally hitting up a house party where we relaxed for a bit and had some orange snacks! Following this, we headed to a massive open air rave, and at this point the day starts to get blurry. 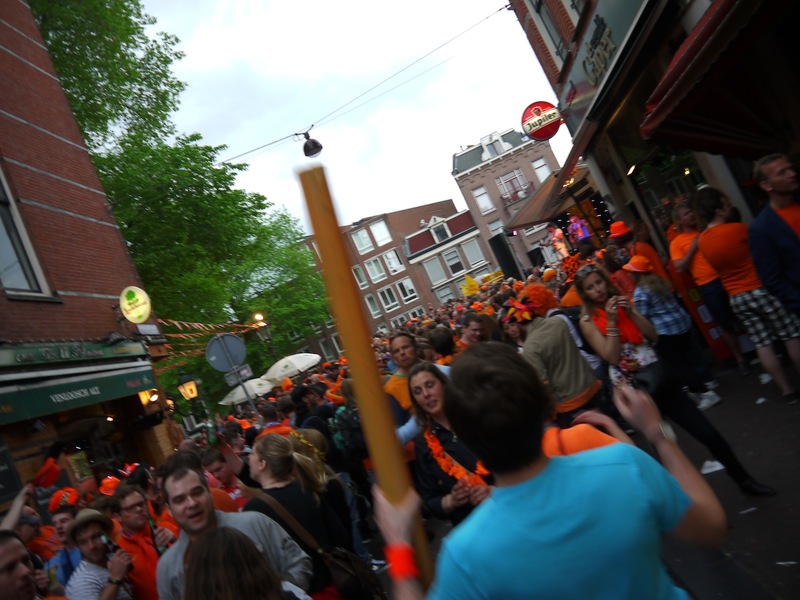 The streets were packed, the masses were wrecked, and B found a large PVC pole to lead our group through the crowd with. I’ll end on this blurry photo of Jess doing flips on the pole in the air – clearly an amazingly fun AND smart decision! 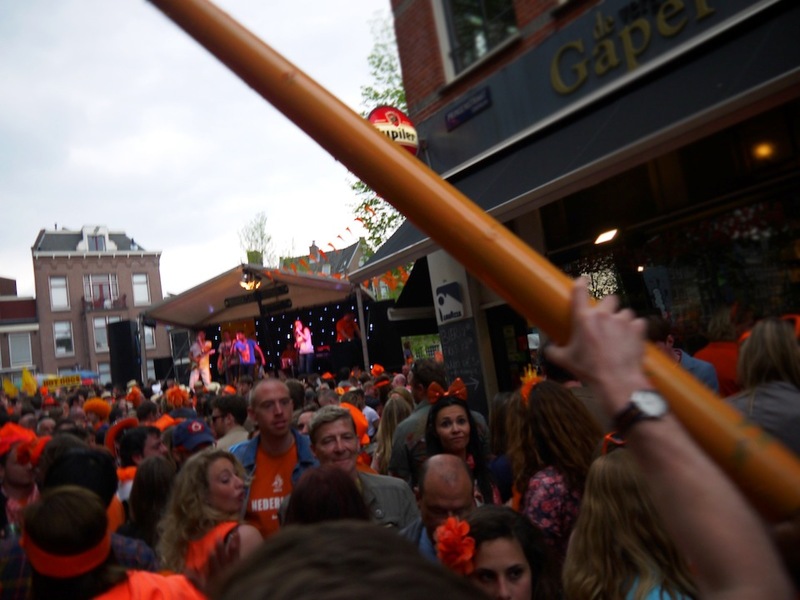 I have to say – this is the longest I’ve lasted on King’s Day. For the past three years, I’ve been home by 5pm, ready for a hearty dinner and an early night in bed. But this year we somehow managed to find another house party, where we danced in the living room until 4am. It was an epic day, and I think I’m going to stay off the booze for a while now! At least until the wedding – my liver needs a break! But overall it was an epically awesome day, and I’m glad I could share the adventure with two amazing American friends, one new, one old :) If you’re planning a trip to Amsterdam, come over King’s Day – between the street food, the thrifting, the range of music, and the parties, there’s something for everyone – and you won’t regret it! I was in Amsterdam earlier this year and would love to go back. 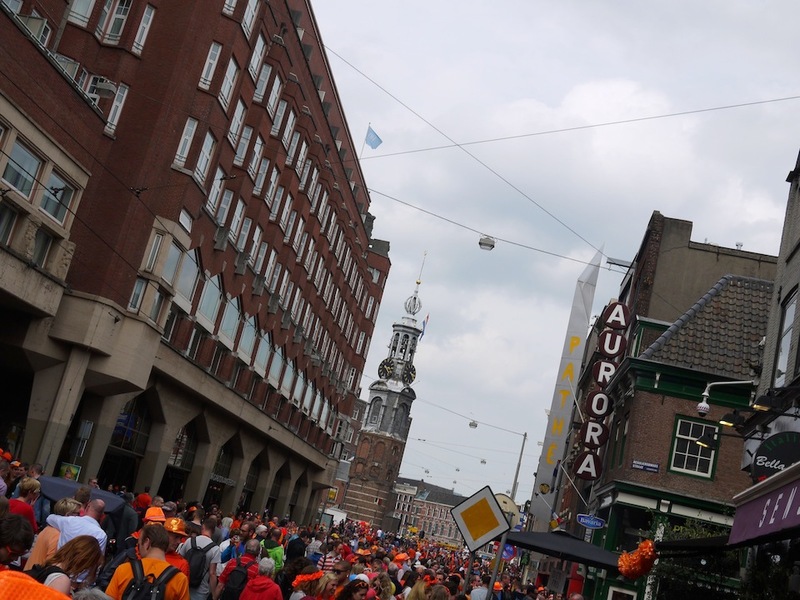 King’s Day sounds fun! wow – I celebrated few years ago. I have wonderful memory. 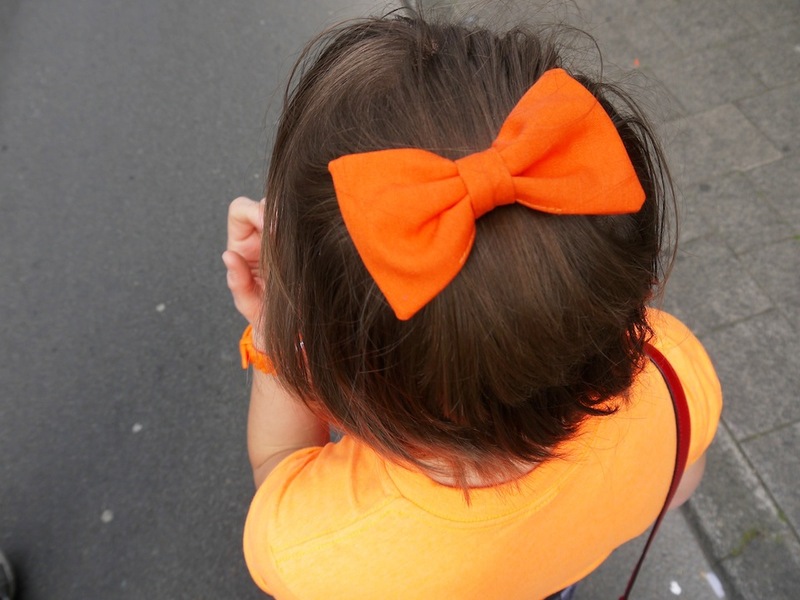 Queen’s Day, on April 30, is the Dutch monarch’s official birthday (it was the actual birthday of Queen Beatrix’s mother, Queen Juliana, but when Bea ascended the date was kept the same). :) And now the 27th is Willem-Alexander’s birthday, so the date has been moved as of this year. I actually saw this really funny (and sad) photo on Twitter: http://bit.ly/1hZHwVN Some tourists who didn’t get the memo of the date change!! The tour books and websites really need to update their info!! Okay, I want to come next year!